Just yesterday, a Youtube user by the name of “Charles Tietjen” posted the video above to Youtube. He attaches Nerf suction darts to his eyes and looks around, which looks a bit odd to say the least. WARNING: This is a bit unsettling, and it personally made me squirm while watching it. Just knowing that Nerf suction darts would be attached to your eyes gets me closing them. In a different video linked below, he says in the description that he has contacts over his eyes. Even so, I WOULD NOT RECOMMEND doing this this, at all. Always wear eye protection when playing with Nerf blasters folks. There’s a less another video he made showing the process of putting them on, which is also a bit easier to take. If you want to see more, someone also made a short gif as well. Check the rest of the post to see that. It’s been awhile since I’ve had the time to look for good Foam Films online, but this newer one by RackaRacka is quite something! Sure it’s got the usual gun sound effects for the blasters, but they sound good here. The cut cutting, extreme action will leave you engaged, and it’s special effects are both good & bad. I don’t want to spoil too much, but that’s part of the charm and humor of the video. There’s a few NSFW words thrown around a few times, but if you can look past that then it’s quite the great foam film. Hey there blog readers. A question I often get asked in my videos is, how do you play Nerf? A similar question I also receive is, what’s going in your videos? Nerf games and it’s rules are not known to the casual viewer or player. There are also no widely sanctioned rules, since Nerf is not an official sport to many the way basketball, football/soccer, or cricket is. Nerf players have used the internet to collaborate and share game types with each other. Below is a list of the game types I’ve personally used when hosting events, and I’ve also listed a few popular ones I’ve seen going around online as well. Feel free to share game types that have worked for you that aren’t listed in the comments section! This post will also be a work in progress, in the future I plan on adding a section for rules that I’ve used in things such as safety, blasters that I allow in my games, hit calling, and things of that nature. Two teams of equal amounts of people and skill face off against each other with 3 hit points. If a person is hit three times, or shot in the head area once, they are eliminated from the game. Getting shot in the head simulates a “headshot.” To win, one team must eliminate all other members on the opposing team. It’s a fairly simple game type mode, but it is one of the more competitive ones. Games can also vary in length, but in my experiences tend to last in the 8-10 minutes mark. You can watch an indoor TDM gameplay video below. – 3/15. 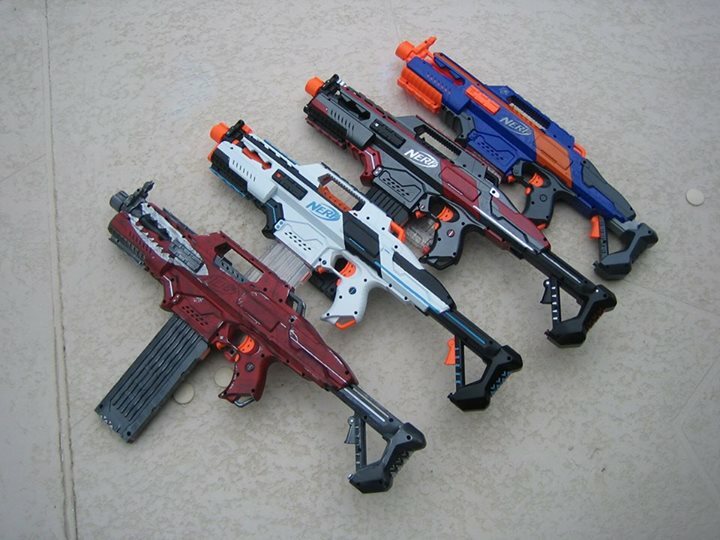 This is popular in NIC Wars featuring heavily modded blasters, homemades, and Stefans. Players again have 3 hit points, but depending on how the rules are set, headshots may or may not be an instant out and only subtract one hit point. If a player is hit, they must leave the immediate play area, count to 15 seconds out loud, and then they are allowed back in minus one hit point. A fair system to help make sure players aren’t overwhelmed by faster firing blasters, but it can slow the game down a bit. – Multiple Team TDM – Played with the either of the rules mentioned above. However, instead of there being two teams of equal numbers, there are more teams with smaller amounts of people in them. E.G. instead of 9 vs. 9, it’s now 3 vs 3 vs 3 vs 3 vs 3 vs 3, or 3 teams of 6 people playing against each other. Usually with bigger areas, you’ll want more teams. In smaller areas, you’ll probably want lesser amounts of teams. You can also add lesser skilled or lesser equipped players to weaker teams to help make up for lesser skilled teams. This is an interesting game mode since it adds another dimension of having to watch out for other additional teams and players. In my experiences it also emphasizes team communication as well. You can watch a gameplay video of it below. Capture the Flag is an old, but classic game type. The most common, and most successful CTF variant in my hosting experiences is having each team have their flag close to their base/spawn point. There are two flags, once for each team. Teams must have both their own flag and opponents in their base for them to win the game. You can do something such as best two out of three games wins, or just winning one game wins the whole thing. If a person is hit (usually once or twice, headshots can or can not make a person go back to respawn right away), they must go back to a spawn point, count out-loud (usually 15-20 seconds/Mississippis is a good number) and their their back in the game. People spawning in can not shoot, and can not be shot at unless they leave a certain area. Organizers must be very careful to not put the spawn points and flags too closely together or else flags are too easily defend-able. Time limits also help a lot to ensure games don’t go too long. 20 minutes has worked well for me. You can watch a gameplay video I recorded of an Indoor CTF game. – Free Floating Flags – Follows the same rules as your usual CTF rules (whatever ones you set or decide to use), but the two flags are “free floating”, which means they are unclaimed and a team must get both in their base in order to win. I don’t recommend this since the game becomes one of agility at the start, and a team could easily get both flags, meaning the game could end early. Speed CTF is a variant of CTF. Rounds are 3 minutes long. People are eliminated and out after 2 hits. Rounds are won by eliminating the opposing team and/or capturing their flag. Each flag capture is a point for your team. First team to 3 points win. After each flag capture, there is a two minute period in which teams gather ammo, then the game is back on. After 3 rounds, if the score is tied, the first team to score wins the rounds. This game type makes the most out of small amount play areas, but it can get a little boring a bit fast. This is due to the game become more of a deathmatch/eliminating the other players since the flags are so hard to get. You can watch a gameplay video of it below however. Siege the Fort is a very simple game, which has seemed to work simplest on playground equipment in parks. This is where it gets it’s name “Siege the Fort” from. There are two teams, offense, and defense. The offensive team has to shoot people on the defending team 3 times each. If a person on the defending team is hit 3 times, or is hit in the head, they must go touch the respawn point and join the offensive team. Members of the offensive team have one hit point in them. If they are hit, they must touch a respawn point. If you want to add win conditions, you can have a time limit that the defending team must try to survive until (10 minutes is a good number), or have the offensive team try and capture an item from the defender’s base. With blasters getting better ranges and higher rates of fire now a days vs. back when my friends and I came up with game in 2012, spawn timers for the offensive team are recommended now. 15 seconds has worked well for my events. You can gameplay videos I recorded for both the offensive and defensive side of Siege. With many people using mag fed, rapid firing blasters now a days, sometimes it’s nice to play slower Nerf game types. Having an all Pistols match accomplishes this goal and can make for a different sort of gameplay. Pistol shaped blasters or single shooting blasters are the only ones allowed in this game mode. Motorized blasters are not allowed in this game. 2 Hits provide a nice medium from my experiences here. – 6 Dart Mags or Less – If you do allow mags or clips, a size of 6 is a nice size. Anything more and that provides too much of an advantage to those using them. – Goldeneye – Based off the “Golden Gun” game type, everybody has 1 hit point. In the James Bond Goldeneye video game, the Golden Gun is a one hit kill on a player. So getting hit is an instant elimination for this Nerf version. This game mode is usually on the quick side. You can watch a gameplay video of the Nerf Goldeneye game type below. The game rules always change when I play this, but essentially you take a few people, give them things such as shields, the best blasters, or a higher hit count, and have them face off against the rest of the players. Game balance is usually very hard to get right in this game type. A “mini” HvZ game with rules designed in mind to be played in smaller areas, speed up the normal game, and help strengthen the Zombies. In the Mini HvZ games I’ve been in, Zombies have stun timers around 15-30 seconds, with 2 or 3 hits to stun them. The Zombies win by tagging all the Humans, and the Humans win by achieving whatever win conditions are set before. This can be things such as trying to survive until a certain time limit is reached, holding onto a flag or item for a certain amount of time, etc. – Objectives – If you want to spice things up, you can add objectives that the Humans or Zombies have to accomplish. Seems work best for bigger, outdoor space. In the video clip below, two teams fight over a flag while trying to defend themselves from Zombies. The Dating Game, also known as the Blob Game, is a game type that actually started off in the Airsoft community. However, it works solidly in Nerf games as well. For Airsoft rules, 3 or 4 teams often start off in even numbers. If a person is tagged, they must kneel or put their hand up, and they can now be physically tagged by any person from a team. When a person is tagged, they are added to the team of the person who tagged him/her. In the end, the game should have everyone on one team trying to hunt down a few or one person. Depending on where you play, the skill level, and the number of people playing, you may want to edit some rules. Rules you can edit include having more or less people on teams, no teams to start off, a timer that must be counted out loud before you tag people to make them join, or having a team win instead of everyone joining the same team. You Can view a gameplay video of a Dating Game variant below. – Game starts off as a free for all. If you are shot, take a knee/put your hand up, and count to five outloud. – When you are tagged after this, you join the team of the person who tagged you. Tagging someone brings them into this new team. There can only be 6 people on a team. – The goal is to have a team of 6 people standing up while everyone else is sitting down or crouched. Again, please feel free to leave a comment and let us know about the kind of game types you and your groups like to play. Which ones in particular have had the most success? Which ones do you feel like have great potential to be fun? Well I’m back uploading Nerf War videos on my Youtube channel now, and I’m trying new things in order for my viewers to follow along more easily. I’ve included Hit Markers/Indicators, which pop up on screen and let you know when I hit a player. They look a little something like the image below. Also as you can see in the top left corner, I’ve included my own Hit Point counter to let you know how many hits I’ve taken, and how many I have left until I’m out. In games like Team Deathmatch, or games where it takes you multiple hits to get out, keeping track of your hits is an important thing. 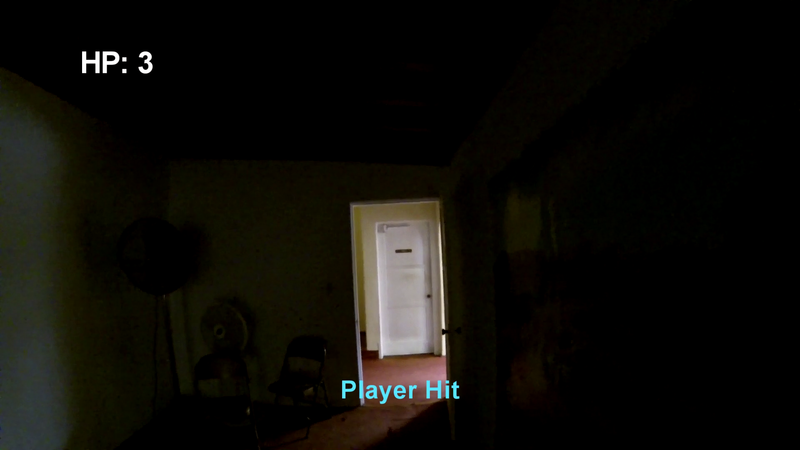 In the video below, the only change I’ve made is that the hit point/life counter only appears when I take a hit. Do you like it with the Counter always being in the video, like in the top one? Or only have it appear once I take a hit, such as in the bottom video? If you could take the time to comment on this post, or any of those two videos, it would be very much appreciated. Also, I have more game play videos from that play session, including 2 Elite Alpha Trooper games, and a little bit of Mega Centurion game play as well. 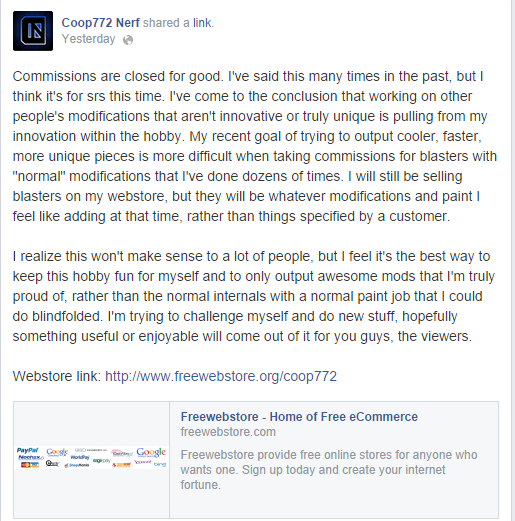 This morning, Nerf Youtuber Coop772 took to Facebook and Youtube to announce that he is retiring from Nerf. Currently standing at 37,544 subscribers, and having been uploading videos on Youtube since June 25, 2009, a time span of almost almost 5 years. Before his retirement and final sales videos, he had a mod/commission video up and more mod/commission videos uploaded a few days before that one. So with some recent back round, the question everyone is asking at the moment is, why did Coop772 decide to quit? We finally get an unboxing video of the new Sonic Ice series that’s been released in Asia. The lighting on it isn’t the best, but the video quality is solid.